Most hockey fans start paying attention to prospects a few months before their draft. Every now and then a kid comes along with the talent that makes the hockey world take notice a lot earlier than that – Jack Hughes is one of those kids. Though he’s not eligible for the NHL draft until the summer of 2019, Hughes has already caught the eye of many around the scouting community. Born in Orlando, Florida, Hughes moved to Toronto with his family where he and brother Quinn grew up immersed in hockey as their father Jim worked as the Director of Player Development for the Maple Leafs. Thanks to their US citizenship, Quinn – a smooth skating defenseman – chose to develop in the US National Team Development Program, with his sights set on attending the University of Michigan in the fall of 2018. Despite his brother’s choice, it is looking as though Jack will choose a different route and start a career in the OHL next season. Though there are still those at USA hockey that hope to persuade Jack to join the NTDP, scouts believe Jack’s desire is to end up in the CHL. Regardless of where he is selected – some think it won’t be until the 2nd pick, as the family has ties to the Guelph Storm – Hughes is going to be the most talented player in next month’s OHL Priority selection draft. Over the weekend, there was a report that the Barrie Colts were trying to trade for Quinn’s rights in order to persuade Jack into committing to be the first overall selection next month. At the same time employees of three different OHL teams told me that they put the odds at better than 50/50 that Jack ends up in the USA Hockey program. The fact is no one outside of the Hughes family knows what is going to happen – heck, even they might not even know yet. There are a few of options open to Jack and his family, leaving numerous questions about his future. One thing that isn’t in question though is his talent. Hughes is likely the most talented player to come out of the GTHL since Connor McDavid and has the talent to be up there with the best players in the CHL in the last decade. At the age of 15, Jack Hughes is already ranked by The Hockey News as the 47th best player under the age of 21. Now there is a lot of guesswork and blind projecting going on there, but it’s all based on one thing – Jack’s hockey IQ. He is a smart player and that is something you can project a lot better than physical growth. Hughes has the instincts that allow him to maximize the physical gifts he has. Many players have either elite skill or elite senses – Hughes has both. He’s got the vision to see plays developing, and the puck skills to capitalize on them. He’s not the next Connor McDavid, but he’s almost certain to be the best player since. 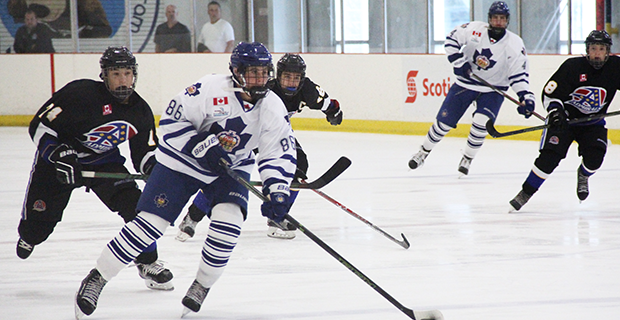 Whether he ends up in the OHL or in the USNTDP, Jack Hughes is destined to be a name hockey fans become very familiar with sooner rather than later.